Hola, sóc en Swasky, també conegut conegut com Víctor (Barcelona, 1975). He dibuixat des de petit. Però tot i ser educat en un sistema educatiu on la creativitat és una disciplina incompresa, on només es té en compte saber respondre bé a preguntes, jo vaig decidir estudiar Belles Arts un cop vaig acabar els estudis de secundària. Després vaig estudiar Comunicació Audiovisual on la mediocritat també era una norma i tot es feia a cop de diners i amb marges de temps suicides. El dibuix sempre ha estat present a la meva vida i ara està totalment present. Hola, soy Swasky, también conocido conocido como Víctor (Barcelona, ​​1975). He dibujado desde pequeño. Pero a pesar de ser educado en un sistema educativo donde la creatividad es una disciplina incomprendida, donde sólo se tiene en cuenta saber responder bien a preguntas, yo decidí estudiar Bellas Artes una vez acabé los estudios de secundaria. Luego estudié Comunicación Audiovisual donde la mediocridad también era una norma. Acabé trabajando en el mundo de la publicidad, donde todo se hacía a golpe de dinero y con márgenes de tiempo suicidas. El dibujo siempre ha estado presente en mi vida y ahora está totalmente presente. Hi, I'm Swasky, also known known as Victor (Barcelona, ​​1975). I've drawn since childhood. But despite being educated in a school system where creativity is a misunderstood discipline, which takes into account only learn to respond well questions, I decided to study Fine Arts once I finished secondary school. After I studied Audiovisual Communication where mediocrity was also a norm. I ended up working in the advertising world, where everything is done in time money and time edges of suicide. Drawing has always been present in my life and now is fully present. Sònar, Ajuntament de Sant Boi, Círculo de Lectores, Ajuntament de Barcelona, Dept. d'Educació, Cercle Artístic de Sant Lluc, Zahorí de Ideas, Librería Universitaria, Waterstones, Metròpolis, Prodeca, Incavi, Icon magazine. 54é Concurs Internacional de Pintura Ràpida de Tossa de Mar (Other media), 2010. "Catalan Wine Landscapes" Sketch Guides Col., 2014. "Nueva vida a tu ropa" (illustrator), 2013. 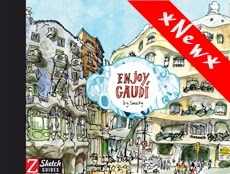 "Enjoy Gaudí" Sketch Guides, 2013. "Voltant per Sants", Ajuntament de Barcelona, 2011. "Twisted reality" Collective exhibition at the Mitte Gallery, Barcelona. Newbury Workshop. Pushing your Sketching Boundaries.Three themed workshop about pushing people how to look. I proposed to attendees working on storytelling and how to add text into their sketches. March. Urban Sketching, drawing on a sketchbook. Seeway School, Barcelona. March. Drawing the Space. IED, Barcelona. Workshop about representing space following the classic conventions. February. Urban Sketching foundations 2. Course held in Sabadell in Escola Illa School of Arts. February-April. Urban Sketching foundations 1. Course held in Sabadell in Escola Illa School of Arts. October - December. Segovia Workshop. August. Pushing your Sketching Boundaries. Three themed workshop about watercolour. I focused my sessions on representing people using watercolour media. Coventry Workshop. May. Pushing your Sketching boundaries. Three themed workshop about space and its representation. I taught about about convention and alternative ways of representing space. Oxford Workshop. July. Pushing your Sketching Boundaries. Three themed workshop about space, colour and people, I taught about about people. Urban Sketching basics. Course held in Barcelona, organized by Drawing On Location. January- June. Urban Sketching basics. Course held in Barcelona, organized by Drawing On Location. Oxford Workshop. Pushing your Sketching Boundaries. Three themed workshop about space, colour and people, I taught about about people. July. Drawing Gaudí. Workshop about urban sketching related to Gaudí’s buildings. Organized by Drawing On Location. June. "Sketching científico" en el Idibaps. Project about communicate scientific research at the Idibaps Institute, Barcelona. Málaga Picassiana. Workshop about colours in Picasso artwork and its links to drawing on sketchbooks. Organized by Diputación de Málaga. "Barcelona Dibuixa", 2012-2013 Workshops related to de USk Barcelona Symposium preevents. Big Draw Barcelona, 2012. Workshop about urban sketching. Organized by Museu Picasso de Barcelona. Urban sketchers Symposium, 2012 symposium instructor, Santo Domingo, República Dominicana. Organized by Urban Sketchers. "Dibuixant la Ciutat", urban sketching workshop, Barcelona, 2011. Organized by Cercle Artístic de Sant Lluc. Hola Victor, felicitarte por tu blog. Siceramente me ha gustado bastante y muchos de tus dibujos, tambien, sobre todo la perspectiva desde el enfoque. Bueno recibe un saludo de un humilde cafetero. Gracias, no había visto mensaje, porque los tengo desviados a una cuenta que el aviso lo había considerado como correo basura. Gracias, ya ves tu que lo mío tampoco es mucho más importante que cualquier otra cosa. Además el café me mantien en muchos momentos despierto. Así que gracias. Nos vemos! I also have just received your "Voltants per Sants"book. I met with Liz Steel last weekend and she passed it onto me. You should be very proud of the drawings and the quality of the finished book. Amazing . You have shown an insight into the area with your colour and lines ! !